LEWCO Multi-Tier Distribution Conveyor System - LEWCO Inc.
LEWCO recently provided a customer with a system of belt and belt driven roller conveyors to handle plastic totes and cardboard cartons in a multi-tiered distribution center. The three-level system delivers replenishment product through the network in the morning and ships picked orders in the afternoon. This is accomplished in a cost-effective and space saving design with reversing, center driven belt and belt driven roller conveyors. 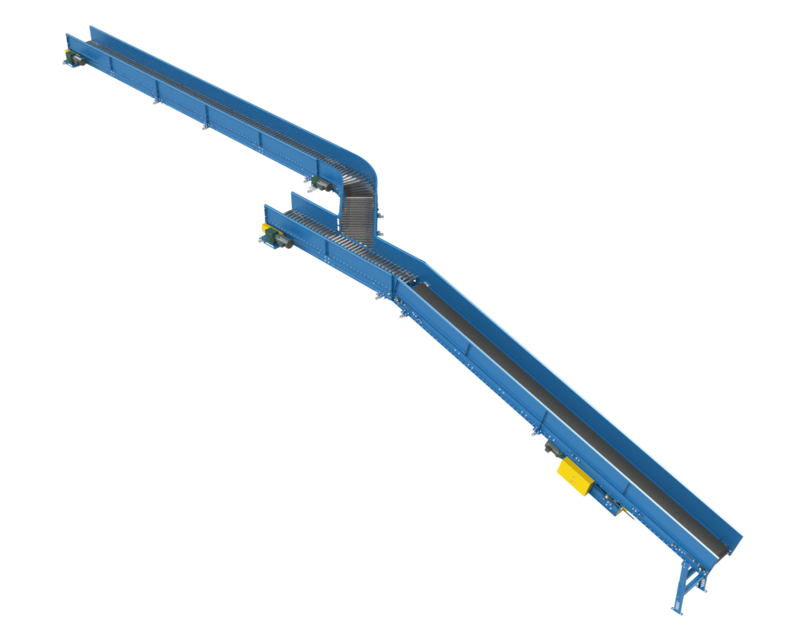 In addition to the pick system, a smaller system of independent belt conveyors assist with the removal of waste material throughout the day. Installation slightly above head level allows continued movement of workers through the area and flared guardrail allows employees extra room to get materials in the conveyor overhead. A 182’-0” continuous belt conveyor with an auxiliary take-up feeds into 77’-2” and 26’-8” consecutive belt conveyors placed at 90° to form a J-shaped system. The combination of flared guardrail and custom 90° transition guardrail engineered to eliminate catch points ensures containment and continued flow of the trash through this system. Full layout 3D CAD models were also provided to the customer to assist with installation and assure design and fit. LEWCO can quote and provide full system layouts at your request. They are recommended for large, comprehensive systems.